This is an adaptation of How Living How To's Cranberry Drop Scones. See above for link. Beat the eggs and add vanilla. In a separate bowl, mix almond flour, coconut flour, baking powered, sweetener, cinnamon and salt. Add egg mixture until it forms a dough. Slowly fold in berries. 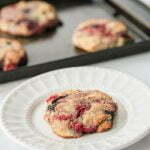 Don't mix too much or your dough will start to look gray from the berries. Put a piece of parchment paper or a Silpat on a cookie tray. Form dough into 6 scones (any form you like really). Bake 12-15 minutes till golden brown. Let sit and cool.